This is just the two of us, rather than the wider family - but it still counts! On Good Friday, as we had a day off school, we decided to do something different. We booked ourselves into i-fly, an indoor wind-tunnel that mimics sky-diving. 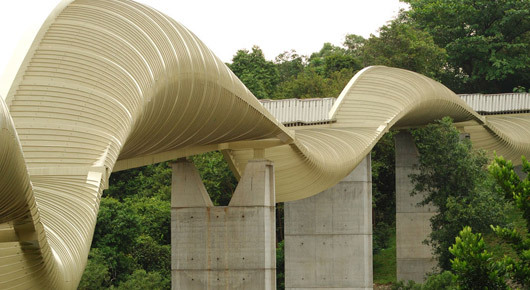 The Singapore centre apparently has the largest such wind-tunnel in the world! 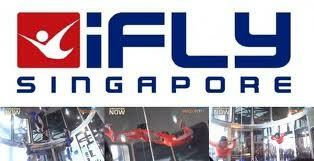 The website for further information is http://www.iflysingapore.com. We had lots of fun, although the time 'in the air' is very short. The three flights each have been woven into the short video below. Enjoy! Summer 2009 proved to be another busy summer. With the Beijing job not working out as hoped, we accepted positions in Singapore, but my official starting date was to be the 13th July. As I had already booked to finish a course in London, and also a chance to see Mum, we agreed with the new school to start on the 27th July. So, the summer began, as last year, with me completing my certification in order to become a school principal. The two courses this year were 'Instructional Supervision - Planning and Assessment' and 'Leadership and Group Dynamics'. Once again, I got to meet Shanhong's new boss, also on the course with me, and also a colleague from Thailand was also on the course. Both courses went well, and I now have a nice plaque! The decision now is whether to attend more courses in the next few years to qualify for the advanced certificate, or to finish there; particularly as my current role has no management responsibility whatsoever! As last year, Shanhong took the opportunity to see a few shows... I managed to see Oliver, Peter Pan and Sister Act with her, but the rest she saw on her own - getting half price or day tickets each day. She also picked up another free CD when she visited Hillsong church at the Dominion Theatre. We then went to Shrewsbury to stay with mum - she's still doing well - getting out to visit members of the family, walking to the shop or post box, there are even rumours of her dancing at a church event and testing a bouncy castle. The physiotherapist has said that in another 6 weeks or so she should be walking much more confidently and normally - so we hope for continued improvements. We'll be back at Christmas, so will see how things have moved on by then, but really hope to get mum out to Singapore sometime - it's a place she says she has wanted to visit for some time. We did a bit of shopping - both in London and in Shrewsbury - nothing very important, but some new clothes, some nice chocolates and an unbelievably cheap coat for Shanhong. Trouble is, with the weather like it is here, I really cannot see us needing coats at all! You can see from the photo on the left that teddy was with us as normal throughout the summer - he got a new top from the Build a Bear Workshop in Covent Garden. 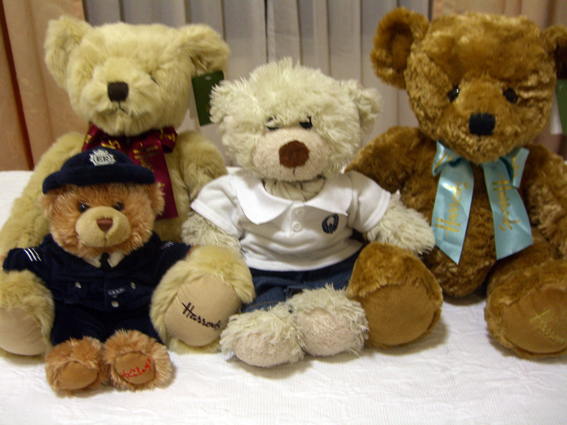 He made some new friends too, as Harrods and Hamleys both had sales in the toy department. We arrived in Singapore late on Wednesday evening, and checked into a hotel for a week. The hotel was in a great central location - but a long way from school. Thursday we met with a housing agent and viewed 11 different apartments. Some we liked, some we didn't! It certainly looked like we were leaning towards the larger apartments - but after weighing up other costs, and distance from school for the daily commute, there were pros and cons to them all. The agent took us to see two further apartments in the evening and we decided to go for one of those. A few negotiations later, it was all signed Monday evening and we checked out of the hotel Tuesday morning and moved in. Our shipping then arrived from China on Saturday, so we've been unpacking, sorting and making this 'home'. The apartment is quite small, on the eighth floor of one of a pair of towers, just 10 minutes from school, and even less distance from the nearest metro station and shopping mall. The towers have good security, and some good shared facilities including a small gym, sauna, tennis court, barbecue pits and most importantly, a rather nice swimming pool. We've been down for a quick swim every night and hopefully, as well as being enjoyable, it may help with the lack of fitness and excess weight! The following pictures will give you an idea of what the apartment is like inside. We have two bedrooms, two bathrooms, a small kitchen and a small living/dining room. Not big by any means,(around 750 sq ft or 75 sq m), but fine for us, especially given the location - and we still have a spare room for visitors.. anyone interested? Just one word of warning for anyone who is thinking of visiting... you are very welcome, but start saving! Of course we are not going to charge you for staying, but Singapore is proving an expensive place to live. We are finding that typical supermarket prices here are dearer than London - and about 4 or 5 times what they were in Beijing. Having said that, there are plenty of food courts - and prices are reasonable - so we've been eating out a lot - including Indian, Korean, Chinese and 'Fish & Chips' - something for everyone! Having had a fantastic trip to Israel, it was time to get ‘back to reality’ in Singapore. We decided it was time to enjoy some local delights, and to visit some of the more touristy places in Singapore. Our first stop was the Chinese and Japanese Gardens, easily reached by MRT (this is the subway or metro or underground – depending on your country!). We took along a picnic lunch, and had a nice day in the sunshine enjoying the gardens. Inside the Chinese Garden is the world’s largest turtle museum, and it was great to see so many of these lovely creatures. Teddy certainly made a friend, and I have memories of one kind of turtle in particular who seemed to ‘salute’ permanently! Another weekend we went on the 'Duck Tour'. The 'Duck' is a remodelled WWII amphibious Vietnamese war craft that doubles as a tour bus and a tour boat. Starting on land, the tour takes you past some famous Singapore landmarks, towards the river, where the craft literally drives down an embankment into the water where it continues as a boat. Having sailed past a few more waterside landmarks, it climbs back up for the return journey on land. The tourist bug continued as we also went on the Singapore Flyer (like the London Eye, only taller) and went to the top of the new Marina Bay Sands resort where they have built a 'Skypark'. The Singapore Flyer, standing at 165m is the height of a 42 storey building and is the tallest observation wheel in the world. As the wheel turns you have a 360 degree view over the island of Singapore, and well as across the bay to the Indonesian and Malaysian islands. There are 28 capsules in total (the number represents 'double prosperity' in Cantonese) including a diamond encrusted capsule that offers in-flight dining. That particular capsule was of course well outside our budget, but the views are certainly impressive. The Marina Bay Sands Skypark is an awe-inspiring engineering wonder. This unique structural masterpiece, designed by visionary architect Moshe Safdie, floats atop the three soaring hotel towers 200m in the sky (taller than the Singapore flyer!). Stretching longer than the Eiffel tower laid down, or four and a half A380 Jumbo Jets, the Sands skypark has 12,400 square metres of space and can host up to 3900 people. The gravity-defying cantilever is one of the largest of its kind in the world and hosts restaurants, swimming pools, gardens and observation decks. That's all for today but there are more touristy bits of Singapore to come in the next report. Take Care! One of the advantages of living in Singapore is the number of long weekends, and the cheap airlines that serve a lot of local destinations. So, obviously we took advantage of this! The first of our local trips was to Bintan, one of the largest of Indonesia's enchanting Riau islands in the South China Sea. The island is reached by modern ferry, and the journey takes just one hour. We were entertained in style with Tom and Jerry cartoons in Chinese for the whole crossing! We stayed at the Bintan Lagoon resort, which is part of the 'Bintan Resorts' complex, the area on the northern coast of the Indonesian Island of Bintan. Here there are five independently owned and operated beach resorts, four designer golf courses, as well as a range of other recreational facilities and attractions. Our resort had a lovely spa, so we had planned to take a massage - but unfortunately it was at 'resort prices' and hence beyond our budget. Shanhong had taken along some 'Dead Sea Mud' though, so had her own 'treatment' in the bathtub! As you can see from the pictures below, this became a weekend of relaxing by the pool and walking along the coast, together with some really good food. Needless to say I came back 'beetroot' from too long in the sun. Unfortunately, while getting to the island was pretty cheap, the costs 'per meal', 'per activity', 'internet per hour' etc made it pretty expensive, so I guess we will not be going back. No problem though as there are plenty of other options, just, as the Tiger Airways ad puts it, a 'nap away' from Singapore. 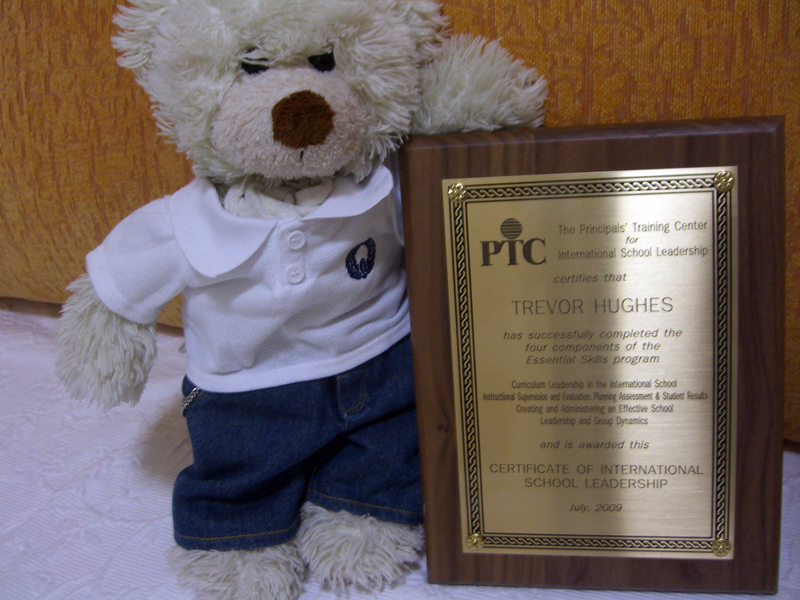 Still, it was a good trip, and Teddy got another stamp in his passport. Another weekend trip saw us go to Phuket in Thailand - a part of Thailand I had not been to before (and would not go to again!). It became another lazy weekend at the beach - but more like Blackpool, overcrowded with tourists! Hence, we headed into town and found a musical fountain show to watch in the middle of a shopping mall, and had our feet nibbled by some hungry fish. The hotel was good - and gave us ideas for the apartment - we may well copy the window between bath and bed - and the red colour may be prominent too! Of course, the only thing that really matters is the food - and it was as good as always! So, there you have it, a couple of our weekends away. Future plans include Resorts World Sentosa with Universal Studios, Chiang Mai, Cambodia, Hong Kong and the Philippines! We'll let if you know if and when any happen. Take care and write soon! You'll have noticed Teddy featuring as always... he is enjoying himself in Singapore. Our other 'tourist visit' was to the Singapore Night Safari www.nightsafari.com.sg. Owned by the same group as the bird park, this trip offers the chance to visit the Singapore Zoo at night, and see some of the nocturnal animals while they are awake and active. Again, it's a nice place, and a good trip, but unfortunately my cheap camera does not take night pictures, and so we don't have any evidence. This row of photos is courtesy of the internet. That’s all for this trip – we enjoyed our long weekend – got to plan another one nowJ.